Near-death survivor provides hope to those who think life is not worth living. This out-of-body, true near-death account of the Other Side reports startling new information and reveals proof of God’s immense love. 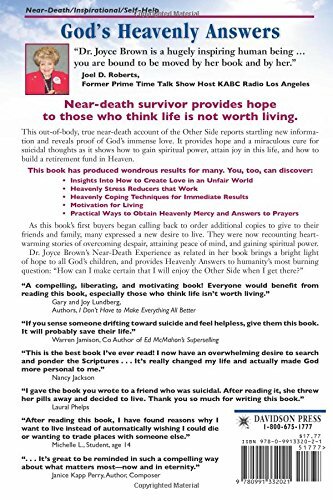 It provides hope and a miraculous cure for suicidal thoughts as it shows how to gain spiritual power, attain joy in this life, and how to build a retirement fund in Heaven. This book has produced wondrous results for many. 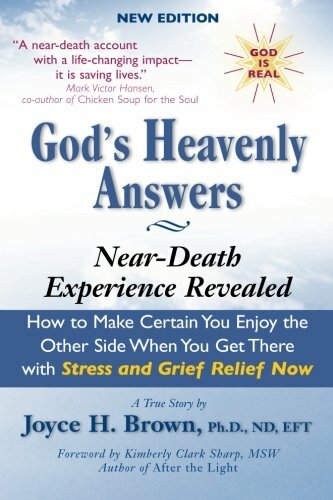 Joyce's book, God's Heavenly Answers is one I've recommended to many of my clients who were troubled. Joyce has definitely changed my life! Her hard-earned sweet spirit and feet-on-the-ground attitude has made her a person whose footsteps should be followed. Many have said they only thought they had problems, until they read her book. Ask for it, and read about her's -- it will change your whole outlook in Life. Love to all. Beautiful web site for a beautiful lady. You have so much love for people. I will say a prayer that you find your angel that will help you to save lives. God Bless you. I am reading your book God's Heavenly Answers, and I am interested in how Sleep Learning works. Could you please send me details. Thank you for your book, all my life at one time or another I have wanted to die, or have asked the Lord to take me home. I now know that the Lord will take me in his time and not mine. Once again thank you for the book. I read Joyce's book a few years ago when I was struggling with spiritual issues. I have always believed in God, but I sometimes doubted my beliefs. The book helped me solidify my spiritual beliefs and helped me to be more positive in my relationship with God, and gives me greater hope in my expectations when mortal life ends. I have re-read the book when I have had spiritual lows, and it always helps me. I feel her book is an answer to prayer. I am fascinated by accounts people bring back about what the spirit world is like. The life review that Joyce writes about especially intrigues me for all its implications to everyone's existence. Applying the lessons of the NDE to life in the physical realm is one of my passions, as anyone can see on my blog. In these troubled times when so many hearts are heavy with grief, depression, rage, and woe, Joyce's book and her work are very illuminating. I haven't had the pleasure yet of reading any of Joyce's books, but I certainly benefitted from the web site. Having known Joyce for a few years, I can attest to the fact that she's a very spiritual and caring lady. I will be back here often and have shared the link with many! I have read Joyce's books and they have helped me in many ways, in different areas of my life. My husband passed away last year. Joyce is an inspiration to me, my family, and many others. To know her, her story, what she has been through, and what she is doing for other's ( a pure lady). I would strongly recommend anyone who has lost a loved one or is or knows anyone that may be suicidal please turn to Joyce for inspiration. I have had the privilege and honor of knowing and working with Dr. Joyce Brown and her dedication to helping others through their grief is truly a miracle. She is a blessing and shares so willingly of her talents, understanding and insights with recovery during the process. Much Success to you and those assisting you in bringing such a needed service to the people. Joyce knows the big picture of life; indeed she has seen more than many of us. She is ever learning, sharing, and helping the troubled soul. In this world of drugs, toxins, bad diets, and bad morals, Joyce is there to lend a healing touch. Several years ago I read the book. Recently I lent the book to a friend whose husband frequently talked about suicide. Although he doesn't discuss the book much, there has been a great improvement in the couple's relationship and in his attitude. Thanks so much for sharing your knowledge with the world. If everyone could look at the world through your eyes on the "other side", we would all think and behave a whole lot differently!